It is generally believed that the name Fraser originated in the French provinces of Anjou and Normandy; the French word for strawberry is fraise, and strawberry plants are called fraisiers. The Fraser arms are silver strawberry flowers on a field of blue, and the wild strawberry became the choice of the Clan for their plant badge. The Frasers first appear in Scotland in 1160, when an early Simon Fraser made a gift of a church at Keith, to the monks of the Abbey at Kelso. The Frasers moved into Tweedale in the 12th century, and more than a few of the heirs native to that district became Sheriffs for the shire of Peebles; during the 13th century, the Frasers spread from there to the counties of Sterling, Angus, Inverness and Aberdeen. During that span of generations, the family brought forth one of its brightest beacons, the original Sir Simon Fraser, often called “the Patriot” by his descendants around the hearths of Clan Fraser, though better known in the days of his military glory as “The Hammer of the English;" after fighting beside the legendary liberator, William Wallace, he came a national hero again, 12 years later, as a knight fighting under Robert the Bruce at Bannockburn, and then joining Sir James Douglas in his pursuit of Edward II’s shattered forces for three full days after the Scottish victory. But two decades later, England would have her revenge: Sir Simon was taken prisoner at the Battle of Halidon Hill, and, reportedly, great satisfaction was taken in torturing him, and in the barbarity of his execution. Thereafter, the senior line continued descent from the Patriot’s elder brother, Sir Alexander Fraser, the Chamberlain of Scotland. Like Simon, Sir Alexander was also a hero of Bannockburn, and married Robert the Bruce’s widowed sister, Lady Mary, who had been imprisoned in a cage by Edward I. His grandson, Sir Alexander Fraser of Cowie, acquired the Castle and lands of Philorth by marriage with Lady Joanna, a daughter and heiress of the Earl of Ross. During the 1360’s, Clan Fraser become connected with the lands of Lovat, and the Aird, at the delta of River Ness. Among the lands later acquired by the Lovat Frasers, the prominent ones were in Stratherrick, which wasvery dear to the hearts of the Lovat Chiefs, the lands of Beauly Priory in Inverness-shire, and the whole of Bisset. In 1460, Hugh Fraser, 6th laird of Lovat, became the first Lord Lovat. The 3rd Lord Lovat became Justiciar of the North of Scotland under James IV; his son, Thomas, Master of Lovat, died fighting for the King at Flodden. In 1544, Hugh, another Master of Lovat, son of the 4th Lord, was killed in battle at Blair-na-Leine, “the Field of Shirts”. In 1592, Sir Alexander Fraser, 8th Laird of Philorth, founded Fraserburgh, and also built Fraserburgh Castle. His son, the 9th laird, married the heiress of the Abernethy Lord Saltoun, and in 1669 their son, Alexander Fraser became 10th Lord Saltoun; this Alexander married three times, and each time forging wise alliances, his wives being Lady Anne Kerr, Lady Marion Cunningham and Lady Sophia Erskine. Following the death in 1696 of Hugh Fraser, 9th Lord Lovat, with no male issue, his widow, Amelia, sought to arrange a marriage between their eldest daughter (also named Amelia) and Alexander Fraser, Master of Saltoun. When Alexander’s father, 11th Lord Saltoun, was traveling to Castle Dounie to discuss the details with the Dowager Lady Lovat, Thomas Fraser of Beaufort (temporarily the 10th Lord Lovat), and his son Simon kidnapped him, along with his confederate, Sir Mungo Murray, threatening to hang them both unless Saltoun agreed to cancel the proposed marriage ceremony, which he did. In short order, young Master Simon and his followers then seized the widow’s manor, where he forced his troth upon her, ordering both a reluctant cleric and the distraught, weeping bride to be held at dirk-point during the hurried wedding vows; reports of this “enforcement” infuriated the Earls of Atholl and Tullibardine, as well as other leaders within Clan Murray, who had schemed to acquire key Fraser lands and holdings through the late Hugh’s daughter. Though the marriage to the widowed Amelia was short-lived, poorly advocated, and even hotly contested, it nonetheless served to win for Simon Fraser the 11th lordship of Lovat, and secured the full possession of the House of Lovat, in perpetuity, for his descendants, who have ever after called themselves Mac Simidh Mor, or “the Sons of Great Simon”. Striving to keep himself uninvolved in light of the escalating enmity with the Murrays, Alexander Fraser married Lady Mary Gordon, daughter of George, 1st Earl of Aberdeen, in 1707; her dowry enabled him to restore the Saltoun Frasers’ fortunes to a further degree. Although Clan Fraser was stoutly on the Government side in 1715, they came out boldly for Charles Edward Stuart in ’45, under the command of the younger Sir Simon of that era. The Castle Dounie, which had been the home of the Lovat chiefs since 1511, was burned in 1746, following the Battle of Culloden, and Young Simon was arrested, but as he was only the Fraser tanist, he was pardoned. Conversely, though, his father would not be allowed the clemency his son had been granted, for as the elder Simon was still the official chief of the Clan, he was held to full accountability by the Hanoverian courts. The verdict set a grim example to all, and the sentence was no less dire: in 1747, Old Sir Simon, the 11th Lord Lovat, who’d captured a bride and a title by sheer audacity fifty years before, was then, at the age of 80, beheaded on Tower Hill in London, earning him the sad distinction of being the last British peer sentenced to die under the axe. 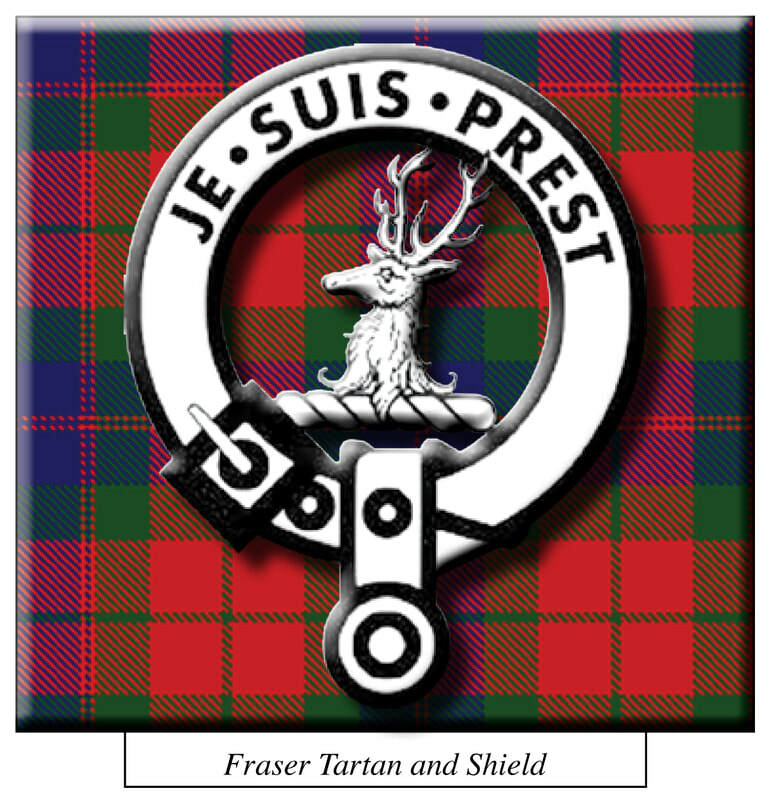 Happily, though, the Clan can also claim a brighter “last”; in 1945, Major Simon Fraser, 15th Lord Lovat (known by his intimates as “Shimi”, per family tradition), became, to date, the last British military commander to be piped into battle (in direct disobedience of orders), as his regiment came ashore, with the Clan piper, on Sword Beach, during the D-Day Invasion of World War II. Like the gleeful appearance of red, ripe strawberries in the gardens of Summer, the proud martial spirit of the Frasers seems to spring perennially from the soil of Scotland.